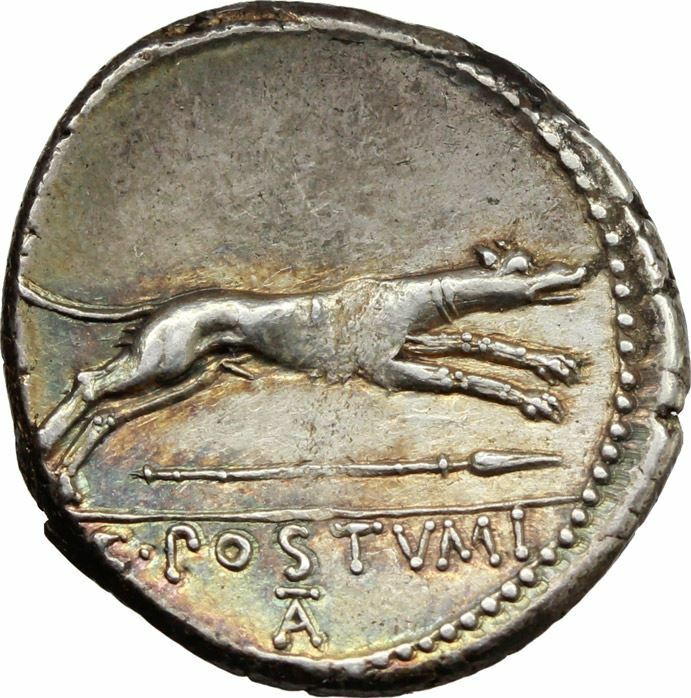 C. Postumius was one of the moneyers for the year 74 BC. He is not otherwise known. Postumia was an ancient and noble Patrician family at Rome. Throughout the history of the Republic, the Postumii frequently occupied the chief magistracies of the Roman state, beginning with Publius Postumius Tubertus, consul in 505 BC, the fifth year of the Republic. Although like much of the old Roman aristocracy, the Postumii faded for a time into obscurity under the Empire, individuals bearing the name of Postumius again filled a number of important offices from the second century AD to the end of the Western Empire. The nomen Postumius is a patronymic surname, derived from the praenomen Postumus, which presumably belonged to the ancestor of the gens. That name is derived from the Latin adjective, postremus, meaning "last" or "hindmost," originally indicating a last-born or youngest child.